Our selection of furniture casters are designed to work with a variety of chairs and furniture pieces in both the home and the office. Our inventory includes casters safe for any floor type. Find chair casters for hardwood floors or casters great for use on carpet or tile. The rubber or polyurethane furniture wheels on our casters are designed to move across a hardwood floor without leaving marks behind them. Or, if you have carpeting or mats in your home or office, we have casters and wheels that can move easily over those surfaces, as well. You can safely preserve the look of the hardwood floors, tile or carpeting in your home or business. Revamp your office and order new casters for a collection of office chairs, equipment or a special display in your retail business. We have a selection of casters that can handle a variety of load capacities while remaining easy to maneuver and park. Find chair casters in chrome, brass, antique brass or black to match any decor. You can select swivel chair casters that complement the look of the chairs and other pieces of furniture in your home or office! 5 pack of 50mm (2") Nylon Twin Wheel Furniture Caster with Grip Ring Stem mount, (7/16" Diameter X 7/8"). Flat Black with nylon hood. 75lb Capacity each. 5 pack of 50mm (2") Nylon Twin Wheel Furniture Caster with urethane tread for hardwood floors and a Grip Ring Stem mount, (7/16" Diameter X 7/8"). Flat Black with nylon hood. 75lb Capacity each. 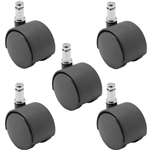 5 pack of 60mm (2.36") Nylon Mag Style Twin Wheel Furniture Caster with Grip Ring Stem mount, (7/16" Diameter X 7/8"). Flat Black with Gray Spokes. 125lb Capacity on each caster. 60mm (2.36") Nylon Mag Style Twin Wheel Furniture Caster with Grip Ring Stem mount, (7/16" Diameter X 7/8"). Flat Black with gray spokes. 125lb Capacity each. Premium Chair and Equipment Black Stem Caster with a 2" Black Polyurethane Wheel and Precision Bearing. Premium Chair and Equipment Black Stem Caster with a 2" Gray Rubber Wheel and Precision Bearing. Premium Chair and Equipment Chrome Stem Caster with a 2" Black Polyurethane Wheel and Precision Bearing. Premium Chair and Equipment Chrome Stem Caster with a 2" Gray Rubber Wheel and Precision Bearing. 50mm Nylon Twin Wheel Furniture Caster with Grip Neck Stem mount, (5/16" X1-1/2"). Flat Black with nylon hood. 75lb Capacity each. Shepherd 50mm Nylon Twin Wheel Furniture Caster with Threaded Stem mount, (5/16" Diameter UNC 18 x1"). Flat Black with nylon hood. 75lb Capacity each. 50mm Nylon Twin Wheel Furniture Caster with Threaded Stem mount, (5/16" Diameter UNC 18 x 1/2"). Flat Black with nylon hood. 75lb Capacity each. BuyCasters Nylon Twin Wheel Furniture Caster with Brake and Threaded Stem mount, (5/16" Diameter UNC 18 x1-1/2"). Flat Black with nylon hood. 75lb Capacity each. CLOSEOUT ITEM, THIS STYLE IS UNABLE TO RE-ORDER WHEN WE ARE OUT OF STOCK. Shepherd 50mm Nylon Twin Wheel Furniture Caster with Brake and Top Plate mount, (1.5"x 1.5"). Flat Black with nylon hood. 75lb Capacity each.